So you’ve read our post with creative Valentine party ideas you can create at Walmart, right? Now you’re wondering what theme we chose for our party? The Drive-In Movie Party! We love a cozy night at home watching movies so this theme is perfect for us. We had a budget of $50 to work with so we combined some items we had at home with lots of fun ideas from Walmart. I started with a cute sign as an invitation to our party. I’ve made this a free download so you can print your Drive-In Movie Invitation here. We have a sectional sofa in the basement so I moved it around to make it look like the back of a truck filled with pillows for comfort. Every drive-in movie needs a cool vehicle, right? 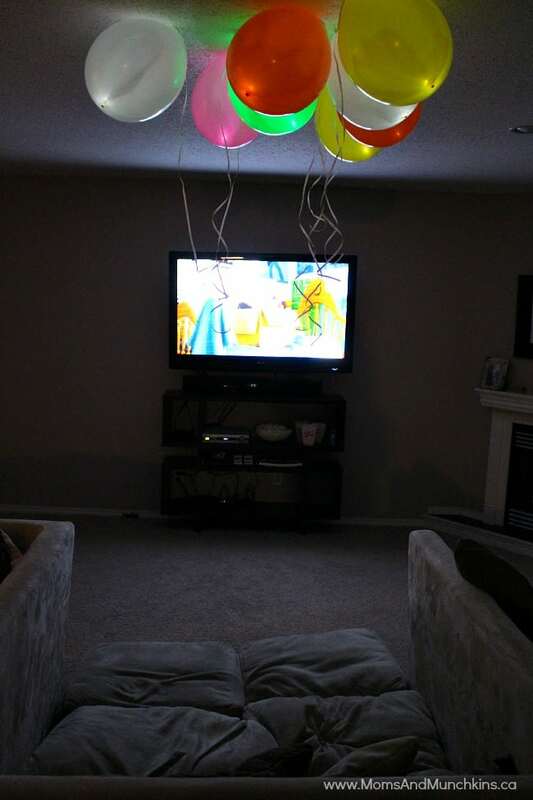 As you’ll remember from my Walmart shopping post, I found these cool glowing balloons and a helium tank at Walmart so I used them to create “stars” for our ceiling. My son loved this part! It was such a cozy setup – my family wanted to sleep down there last night. 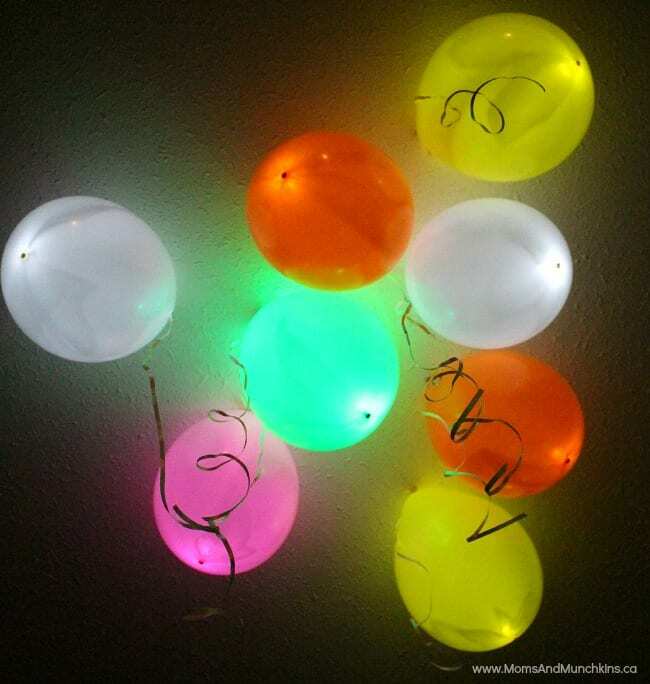 I really love those glowing balloons and I’m going to buy more for my son’s dance-themed party this spring. 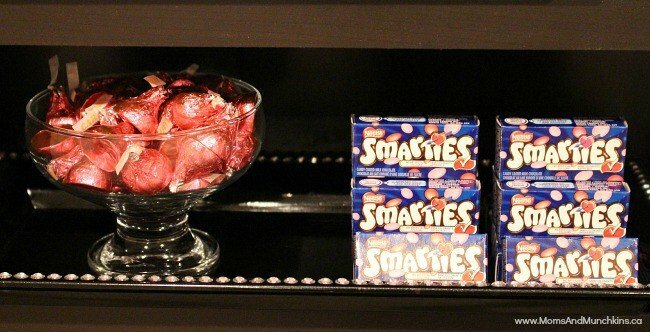 The stand under our TV has several shelves on it so I used this to hold all the movie night snacks we picked up from Walmart – popcorn, mini Valentine’s candy (Smarties and Hershey’s Kisses), cookies and pop. You’ll find a large variety of movies at Walmart to choose from. 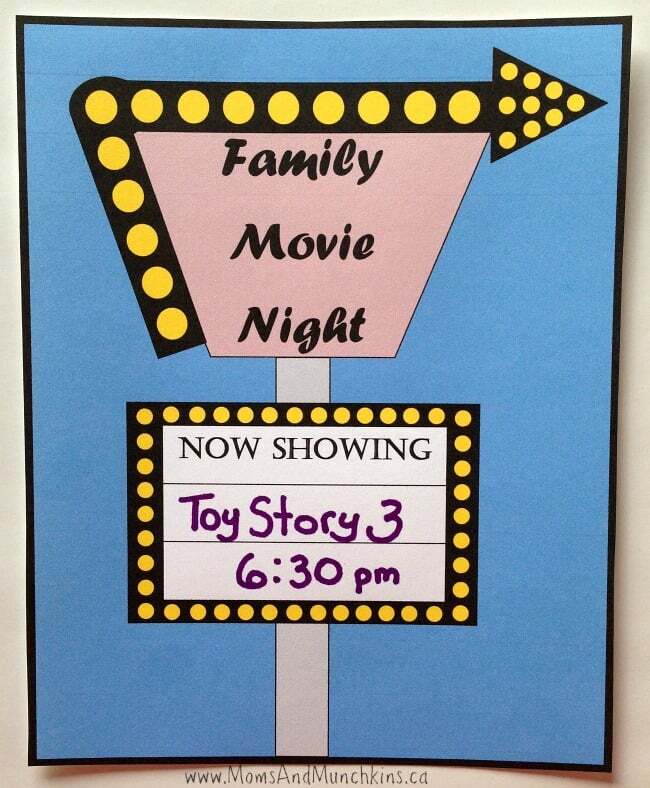 We picked a family favourite – Toy Story! 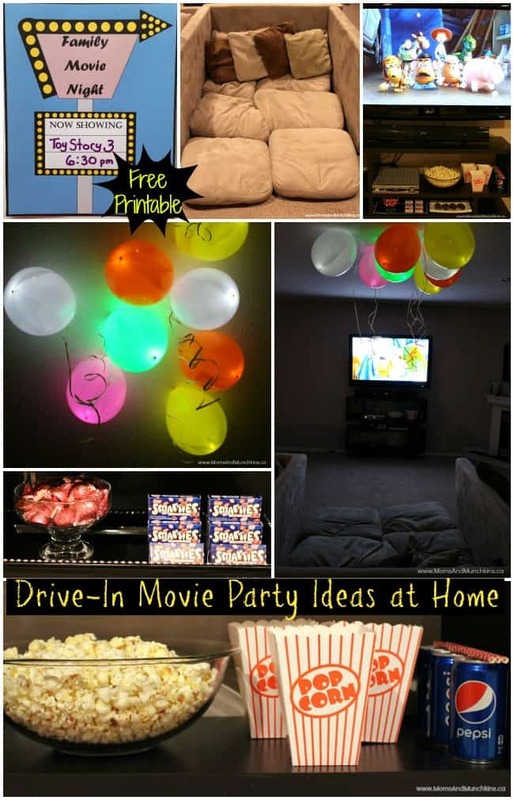 It was such a cozy little setup and we look forward to our next Drive-In Movie Party for Valentine’s Day. For more Valentine’s Day ideas, visit our special Valentine’s Day page. This post is sponsored by Walmart Canada, as part of the #FromtheHeart program. In exchange for this review, I have received special perks in the form of products and/or compensation. All opinions on this blog are my own. Yes, I’m pretty sure we have the Toy Story movies memorized around here. Oh, my son LOVES the part at the beginning when Peabody is doing the Zumba! 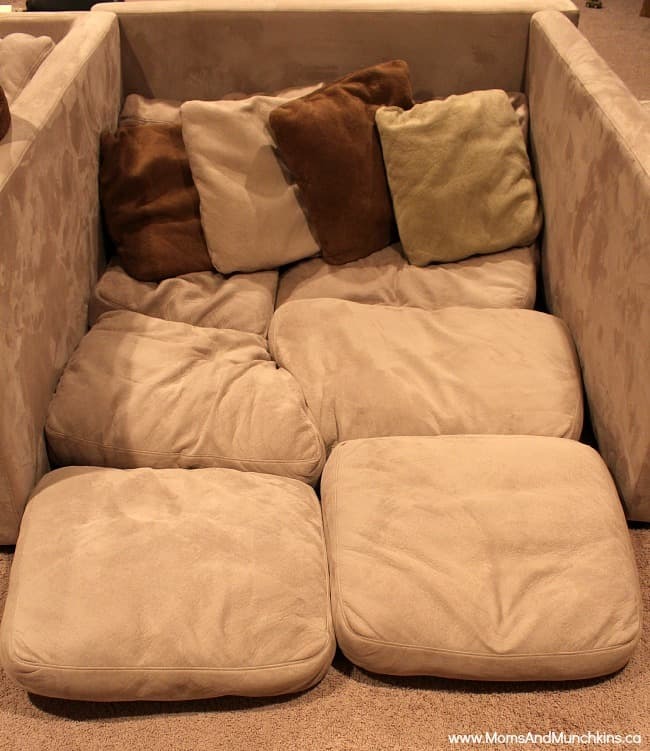 Moving the couches around to make your pickup bed is such a fun, clever idea! 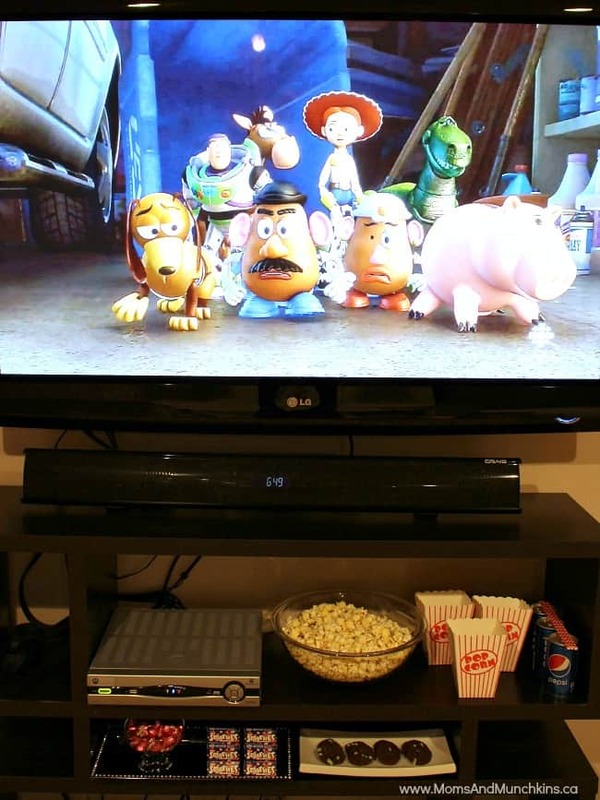 I’ll bet the kids just loved it, and want to watch EVERY movie this way from now on! Thank you, Nikki! We still haven’t moved the couch back!